Before buying the marine plywood, the most expensive item in building these boats, we had to determine how many 4′ x 8′ sheets we required. A materials list comes with the plans but the plywood specified is 5′ wide which is not available here. 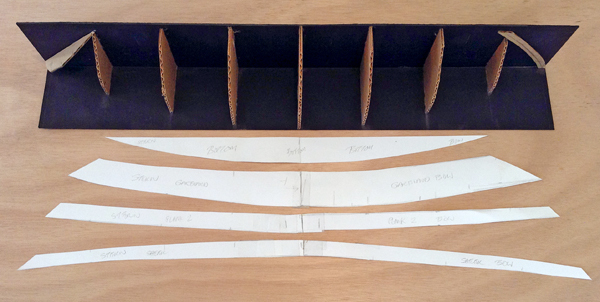 By building a simple scale model using cardboard and bristol board we were able to calculate the widths for each plank and the number of strips we could get from each sheet of plywood. This entry was posted in Uncategorized and tagged Amberjack Dory, Boatbuilding, Dory Boat, Iain Oughtred by ayleofquinte. Bookmark the permalink. You guys are too clever!